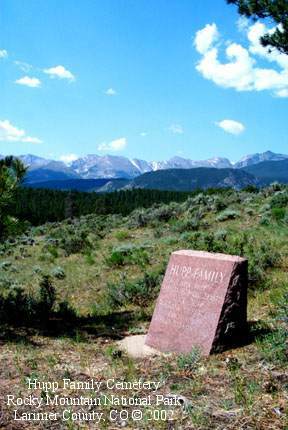 The Hupp Family Cemetery is in Beaver Meadows in Rocky Mountain National Park. It is about 300 feet north of Upper Beaver Meadows Road from a point about 0.2 of a mile from the beginning of the intersection of Upper Beaver Meadows Road (a dirt road)and the paved road leading to the Beaver Meadows Entrance Station. GPS coordinates are 40 degrees 22 minutes 19 seconds north, and 105 degrees 35 minutes 41 seconds west. Note that although the headstone at the Hupp Family Cemetery spells Fannie's name as "Francis," all of the other references to her spell her name as "Frances."